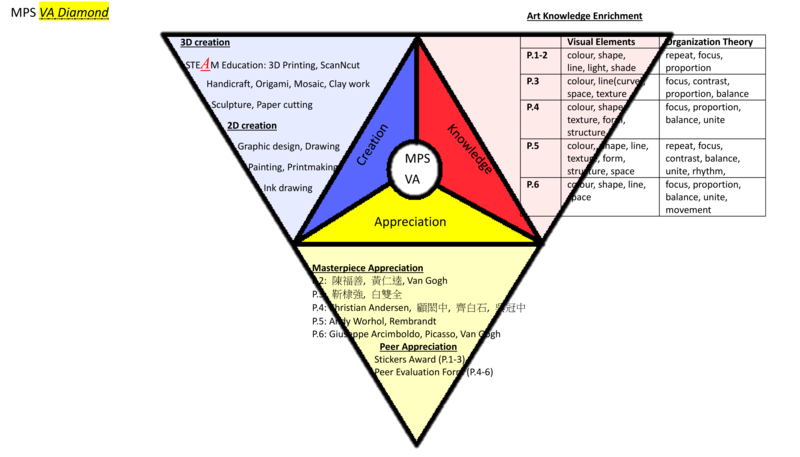 The ‘VA Diamond’ shows the spectrum of Visual Arts curriculum at MPS, composed of three primary colours: Knowledge (Red), Creation (Blue) and Appreciation (Yellow). Through active enrichment in art knowledge and participation in art creation and appreciation, students will develop new and different ways to enhance their power of imagination, creative thinking and presentation skills. Students can use visual arts to express themes and topics related to themselves, their surroundings and the works of other artists. Throughout the 6-year primary arts education, students are equipped with different visual elements and organization theories. They then possess the ability of art appreciation and can pursue further artistic development. To inspire students’ artistic intelligence, a variety of art creation, like 2D and 3D artwork, is introduced. The globally renowned STEAM education, where A stands for Arts , is also incorporated in the curriculum to give students a brand new experience in 3D art creation. Art creation from 3D printing and ScanNcut machines is encouraged. Through appreciating masterpieces, students can learn more about the drawing techniques from famous local and non-local artists. His earlier works were mostly realist watercolour landscapes and earned him the reputation as the ‘King of Watercolor’. His current works are mainly depicted in a fantasy way. His works involve painting, photography and conceptual art addressing the connections between individuals, cities and nature. His literary works include ‘Little Mermaid’ and “Ugly Duckling’. He usually cut paper into figures related to the stories he shared with children. A globally renowned Chinese painter in ink drawing, best known for capturing the essence of the swimming feeling of shrimps, fish and crabs. His works are influenced by both Western and Chinese painting styles.